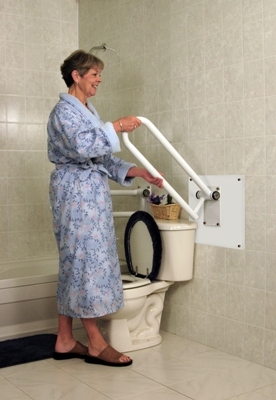 A unique offset support rail for use on one or both sides of a toilet. Easily folds up to store out of the way when not in use. 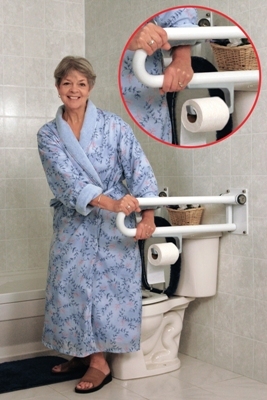 Excellent assistance for getting on and off the toilet. Convenient And Safe. 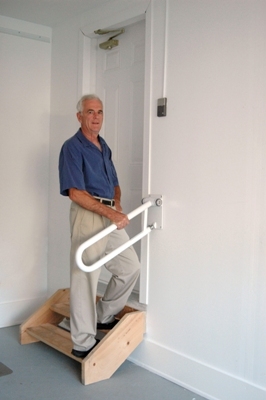 The hinged P.T.Rail™ easily folds up to store out of the way and will not accidentally fall down causing an impact injury. Unmatched Sturdiness. Unlike other fold down rails that wobble, the P.T.Rail’s™ machined, precision, tension fit hinge creates stable, rock solid support. A proven rail designed to suit home or institutional use. Toilet Roll Holder. Add to any P.T.Rail™ to eliminate the need for unnecessary reaching and twisting. Sold Separately. Materials/Finish: White powder coat or choose upgraded options. Rail Diameter: 1.5"/3.81cm (Incorporates ADA Guidelines). Rail Lengths: 28"/71cm or 32"